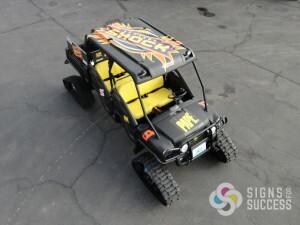 “Pape Machinery is sponsoring the Spokane Shock football team this year and had us wrap a John Deere Gator for them. The Gator will be used at home games and other events to promote the utility, versatility, and overall fun of this John Deere unit,” Signs for Success owner John Bogensberger explained. This cool matte black wrap is dotted with decals all over the hood and body. A giant Spokane Shock logo decal tops the vehicle, and is placed strategically to be seen from the stadium seating all around, making this one awesome looking John Deere Gator. Off road wraps are unique because we often work with less common, rugged shapes. “One challenge with the Gator was the roof,” Signs for Success designer Kimberly Hoffmann said. “There were deep grooves in the roof, and we had to calculate how the graphic was going to lay out going in and out of the grooves.” Kimberly took special care to make sure the logo would not be distorted when it was applied. The installation was a little more time-consuming than most. Before installation even began, most of the parts of the gator had to be removed, then re-installed after the wrap was complete. With all the smaller decals that had to be installed over the wrap, our install team worked tirelessly to get every decal just right in a layout that is seamless and looks effortless. The finished product was absolutely worth the extra time. 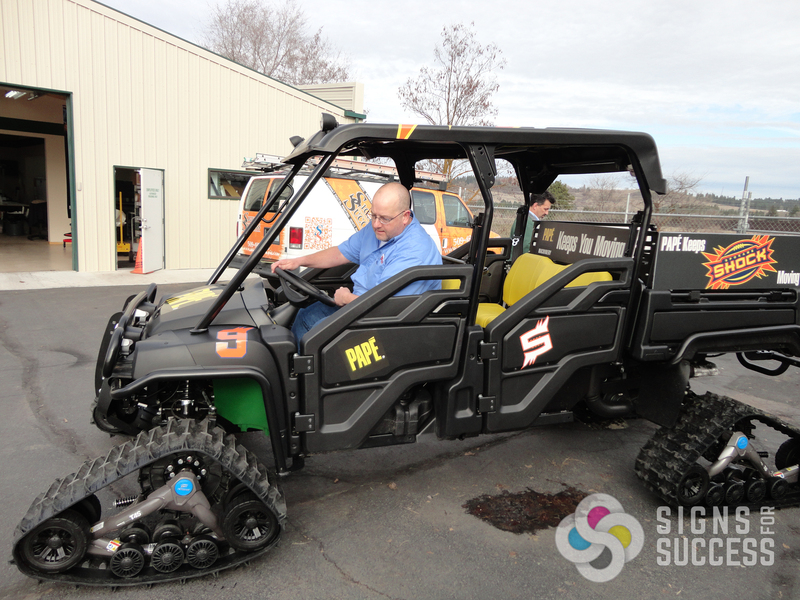 We were able to work with the unique shapes, grooves and parts of the John Deere Gator to create a great promotional vehicle wrap. We have designed, printed and installed hundreds of vehicle wraps, including off road wraps. Although most of them are for cars, trucks, SUVs and other common vehicles, we have successfully wrapped such uncommon vehicles as boats, motorcycles, go karts, Zambonis, golf carts, and more. 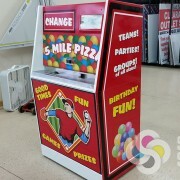 If you have a unique vehicle you want to make into a promotional tool, or just want to make it your own, let Signs for Success help you achieve your vision! Contact us today for a free quote.